ABOUT BLAKE CROUCH: Blake Crouch was born in Statesville, North Carolina and graduated in 2000 with degrees in English and Creative Writing from the University of North Carolina. He has written four previous novels and a host of short stories. Two of his stories have been optioned for film adaptation. Blake currently lives in Durango, Colorado with his wife. ABOUT JACK KILBORN: Jack Kilborn is a pseudonym for J.A. Konrath, the award-winning author of the Jack Daniels series. He is also the editor of the hitman anthology “These Guns For Hire”, and his short stories have appeared in more than sixty magazines and collections. As Jack Kilborn, the author has written the horror novels Afraid, Trapped, Endurance and Draculas. For everyone who thinks the bad guys are so much more fun to read than the good guys, this is a book just for you. The definitive volume containing every major villain from the Crouch/Kilborn/Konrath Universe is here. First, there was Serial, the collaborative smash-hit that has been downloaded 500,000 times and optioned for film. Then came Serial Uncut, which expanded on that story. Then Killers, the sequel to Serial. This epic work, over two years in the making, contains Serial Uncut, Killers, Birds of Prey, Blake Crouch's Break You, an interview with the authors, and more. If you haven't read anything by Blake Crouch, Jack Kilborn, or J.A. Konrath, Serial Killers Uncut is the perfect introduction to the dark side of their universe. And if you enjoy a despicable bad guy (or bad girl), you're going to love this. There are twenty-one serial killers featured in this book: Lucy and Donaldson from Serial, Orson and Luther from Desert Places, Locked Doors, and Break You, Mr. K from Shaken, Alex and Charles Kork from Whiskey Sour and Rusty Nail, Isaiah from Abandon, Taylor from Afraid, Javier from Snowbound, and many, many more. There are some good guys too, including Andrew Z. Thomas (Desert Places, Locked Doors), Jack Daniels (Whiskey Sour, Shaken), Violet King (Locked Doors, Break You), Tequila (Shot of Tequila), and Clayton Theel (Draculas). FORMAT/INFO: The Serial Killers Uncut e-book is 500 pages long divided over twenty Parts and an Epilogue. Also includes an Introduction, an Author’s Note, a character cast, storyline endnotes and various excerpts from the authors’ books. Narration is mostly in the third-person via Luther Kite, Orson Thomas, Donaldson, Lucy, Taylor and many other characters. A first-person POV is also provided for Jacqueline “Jack” Daniels. Serial Killers Uncut can be read as a standalone, but the ending will leave the readers wanting to know more. 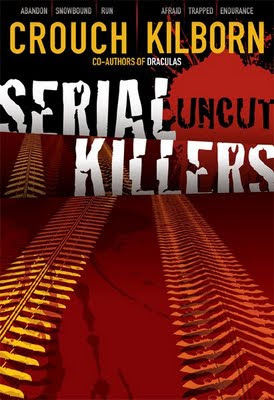 May 9, 2011 marked the e-book publication of "Serial Killers Uncut". Cover art is provided by Jeroen ten Berge. SKU begins with an Introduction, followed by twenty chapters that focus on Luther Kite, Orson Thomas, Donaldson, Charles, Alex Kork and various other characters. Luther is arguably the book’s main character since readers are given insight into his life from a child all the way to adulthood, including the first meeting between Luther and Orson. The cool thing about this book is that each character is hyperlinked to a ‘Characters’ page, where a description of their first appearance and nature is provided, which is handy to have when you are beginning each story and learning about a new character. The sequence of the stories is chronologically listed with the actual books serving as time gaps. Besides Luther Kite, the first twelve chapters also provide small snippets into the lives of the other characters mentioned above including Orson and Andrew as twins who play and love each other, Donaldson learning his craft from one of the most depraved killers out there in Mr. K, and the Kork family. Further down the road, readers are shown Lucy’s initiation to the craft by her peers in “Bad Girl”, and the prostitute Toni meeting the Gingerbread Man only to realize how much she wants to live. Then comes the incredible chapter thirteen, “An Unkindness of Ravens”. Featuring around twenty-one characters—both heroes and villains—from the worlds of Blake Crouch & Jack Kilborn, this chapter is easily the highlight of the book with the authors playing to their strengths with witty dialogue and visceral thrills colliding in the ultimate ‘bad guy’ convention. Plot twists are a bit predictable, but “An Unkindness of Ravens” was a blast to read with almost every character bumping into each another, with entertaining results. Plus, there’s even a nod to thriller legend David Morrell. From here, we have “Serial”, followed by “Killers” where Lucy and Donaldson meet each other, giving readers two of the most thrilling chapters in the book. Lastly, there’s the inclusion of the novella “Break You”, which is the conclusion to the Andrew Z. Thomas storyline. The only complaint I had about Serial Killers Uncut was an episode occurring in a chapter that contradicts what has happened in Shaken. Reportedly, clarification for this contradiction will be provided in Stirred, the final book, so I’m willing to go along with it for now. The plot was also a bit disjointed, but because of Blake Crouch & Jack Kilborn’s terrific writing, I was completely hooked by the story nonetheless. This post makes me wonder why bad guys are more fun to read about than good guys ... could it be due to the creepy factor? (Creepy guys are definitely more entertaining ... at least that's why I like reading about vampires.) I figure we live with good guys so we think we know all about them. We read about the abnormal people because the unknown or surprise element is probably more entertaining. The fascination with the unknow/abnormal is definitely a huge factor in the success of Serial killer thrillers. This book manages to upturn the normal convictions set by Jeff Lindsay & Dan Wells. As the protagonists have no reeeming qualities at all and are interesting to read about. Mihir - great review....Jack and I are constantly amazed that people not only are willing, but love reading about our creations in SKU, who, as you put it, have absolutely no redeeming value whatsoever. I think it has to do with a fascination with the criminal mind and the darker side of the human psyche. I used to be on a maximum security prison row with real serial killers. I even saw the real "Leather Face" when I was processing out of T.D.C.J. in 2005. Another one for the TBR that seems to grow 3 times faster than I can read it. Thanks for your comments, the fascination is definitely there, but I guess the biggest draw is your & Joe's writing skill which makes these despicable characters so engrossing to read about. You could try the Andrew Z. Thomas trilogy by Blake Crouch. Its pretty dark and about the same level as Serial Killers Uncut. Another series that I like is The Amanda Jaffe series by Phillip Margolin. Starting with Wild Justice, Ties That Bind, Proof Positive & Fugitive, each book can be read as a standalone. But the overall story arc is advanced skillfully.